Brodie Tree Service has a great selection of sizes and varieties of tree species at the farm. 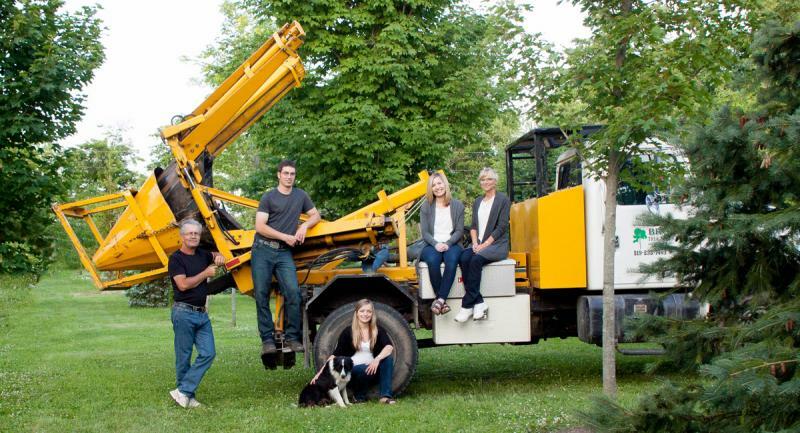 At Brodie Tree Service & Sales, we operate spading equipment to spade your tree or purchase one of ours. We run a 30", 50" and 90" size spades plus a pod trailer option for far away destinations. Please make your first stop at our farm the office, where you will find information about the trees we grow, as well as pictures of other jobs we have done! You are welcome to stop by the farm at anytime, but will need an appointment if you would like a consultation. Our family farm also grows wheat, corn and beans. There is always something for anyone of our family (pictured below) to be giving a helping hand, whether it be in the field, cutting grass, weeding, pruning, watering or giving a tour. Never say you're bored here, or you will be asked to pick stones!